Hourglass to me was one of those books you keep looking at and saying you're going to read it, but never get to it. And once you do you ask yourself "why the heck did I wait so long to read it?" I loved it! 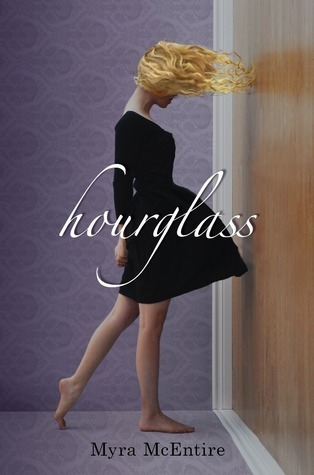 In the very beginning I didn't think that I would love Hourglass because I was a little annoyed with the main character Emerson. I felt she was very immature and I thought for sure I wasn't going to like her. But somewhere down the line in the book she matures, a lot. Emerson had a very hard time with her visions and didn't understand why it was happening to her. She meets Michael, the guy her brother hired to help her, and Michael introduces Emerson to a whole new world. She gets all of her answers and more. Their romance also made me laugh a couple of times. It was one of those relationships where there is just so much chemistry in the air between the two, but they spend most of their day picking on each other and denying there are any feelings for each other. Emerson had a smart mouth and every time Michael would throw something at her, she had a something smart to throw right back at him. It was hilarious! Though Hourglass can be predictable at times, there was one part that just broke my heart. Emerson’s heart was finally beginning to heal and she was learning to accept that this was her life, and then BOOM! She gets her heart shattered again. And like I said, even though it was predictable, what she does next to change everything was just worth it. I really liked it! Overall, I think Myra McEntire did an excellent job with the world she created and also with explaining how time traveling works for Emerson. I thought I would be lost and have a hard time understanding exactly how it works, but I wasn’t one bit. Besides the little things I mentioned above that annoyed me, I still give Hourglass FIVE stars and highly recommend it. Michael is just swoon worthy and the middle to end was just O-M-G good. There is also a super-hot make out scene that will give you goose bumps. I loved Hourglass and I can't wait to read whats to come next. A MUST READ! I really enjoyed it! LOl I can't wait either! It was a great read and a nice change from all the dark and paranormal stuff I read lol. This sounds like a great book. I've had it on my to-read list for awhile now, and I think I need to bump it up.